1. AY-75 66 - 88 MHz. 10 MHz. 10 dBi. 2. AY-150 134 - 174 MHz. 10 MHz. 12 dBi. 3. AY-350 300 - 400 MHz. 20 MHz. 13 dBi. 4. AY-450 400 - 512 MHz. 25 MHz. 13 dBi. 5. AY-850 700 - 1000 MHz. 100 MHz. 13 dBi. 6. AY-1450 1300 - 1600 MHz. 120 MHz. 13 dBi. 8. AY-250 220-290 MHz 20 MHz 13 dBi. 10. AY-550 512-608 MHz Entire Band 13 dBi. 11. YR-575 518-630 MHz 518-630MHz 13 dBi. 12. AY-650 614-698 MHz. Entire Band 13 dBi. Antenna Experts manufacture yagi antenna for 75MHz, 150MHz, 350MHz, 450MHz, 550MHz, 650MHz, 700MHz, Lower 700MHz band, 850MHz, 1450MHz, 1850MHz and 2450MHz frequency bands. Our VHF Yagi antenna, UHF Yagi Antenna and Microwave Yagi Antenna design reflects innovative modern antenna construction. The mounting hardware of VHF UHF Yagi antenna is made of type 316 marine grade stainless steel. Antenna Experts also manufactures yagi with reflector for digital TV gap-filler application for 470-860 MHz frequency band. Antenna Experts manufactures YR series of yagi antennas for wireless digital TV gap-filler application. The YR-575 yagi with reflector is highly suitable for vertical polarized power repeater application and low-power horizontal polarized digital TV gap-filler application from channel 27-40 frequency 518-630MHz band. Wireless digital TV gap-filler (Re-emitter) provides effective solutions for blind zones and shadowy zones. Yagi with reflector is mainly used in expressways, railways, tunnels, country sides, homes, multi-stories buildings and elevators. The unique design of the yagi antenna feed which works as matching device to keep the VSWR low resulting in increased efficiency of the yagi with reflector. The mounting hardware supplied facilitates mounting on either vertical or horizontal members. The grid reflector supplied in two segments for easy of shipping and handling. The yagi with reflector is highly suitable where high front to back ratio and high side lobe suppression are required. Radiating elements and grid reflector members of YR series yagi’s are permanently welded to the support boom making it highly rigid and to withstand the high wind load. 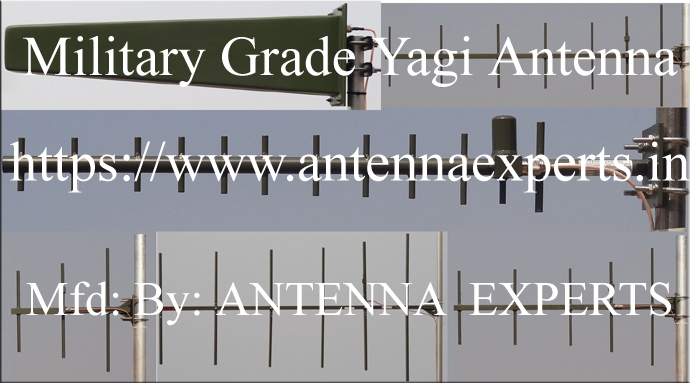 The complete YR-575 yagi antenna with reflector have been constructed in high quality 6063T6 ultra corrosion resistant architectural anodized aluminum alloys to prevent corrosion. Our AY-550 and AY-650 yagi antennas are highly suitable for technical requirements for Remote Rural Broadband Systems (RRBS) operating in the bands 512-608 MHz and 614-698 MHz (TV channels 21 to 51). For higher gain these antennas can supplied with trough reflector to increase the front to back ratio and minimize the side lobes. The trough reflector is supplied in two segments for easy of shipping and handling and can be assembled in less than 2 minutes with simple hand tools. The yagi antenna with reflector uses special feed which eliminates the use of folded dipole. The Yagi antenna with reflector is supplied with N termination fixed on the driven element. The grid reflector increases the front to back ratio and reduced the side lobe level. This directional yagi antenna comes factory tuned and does not require any field adjustment. The small surface area on the yagi antenna minimizes wind resistance and conserves tower loading capacity. Radiating elements, supporting booms and adjoining metal castings of Yagi antenna have been constructed in 6063T6 ultra corrosion resistant architectural anodized aluminium alloys to prevent corrosion. Our VHF UHF Yagi antenna is supplied with powder coating finish to protect the yagi antenna further from severe environmental conditions. The VHF Yagi antennas when packed, comes with elements removed from the antenna boom for ease of packing and transportation where as the UHF Yagi Antennas comes in pre-assembled design with permanently fixed elements in to the support boom. Antenna Experts Yagi antenna design reflects innovative modern antenna construction. The unique design of the yagi antenna feed which works as matching device to keep the VSWR low resulting in increased efficiency of the yagi antenna.